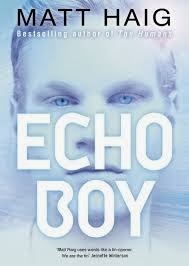 Book Review: Matt Haig's "Echo Boy"
Home » books » review » Book Review: Matt Haig's "Echo Boy"
Set far in the future, Echo Boy introduces us to a world filled with androids, or Echos as they are known. These machines are human replicas programmed to be faster, stronger and obey orders. However, when fifteen year old Audrey’s family’s Echo malfunctions the consequences are devastating. Distraught and having to escape the family home in a hurry, Audrey is taken in by her estranged Uncle; a rich and powerful man who happens to own one of the biggest Echo manufacturing companies on Earth. As Audrey struggles to make sense of the tragic events which have befallen her she becomes intrigued by Daniel, a new prototype Echo, who has an unusual interest in her. Told from the alternating points of view of Audrey and Daniel, this is an enticing exploration of what makes us human. Haig explores a world in which art and philosophy as we know it are dying out, proving of value only to a limited few. As we delve deeper into Haig’s expertly imagined world, we become immersed in his profound questions about existence, corporate power, and progress. These themes are handled with skill and subtlety. The book is both an adventure story, and an unconventional love story, though Haig refrains from making too much of this, instead handling Audrey and Daniel’s relationship with care and sincerity. As a reader this is an infinitely rewarding novel as the futuristic world is imagined in such detail, it begins to live before one’s eyes. With pods which allow virtual travel, houses raises above sea level, and the far off community who live on the moon, the details are rich and beautifully rendered. Haig’s newest book for teenagers is an imaginative, intelligent novel, which is engrossing and moving. This review was first published on the Literature Works site.